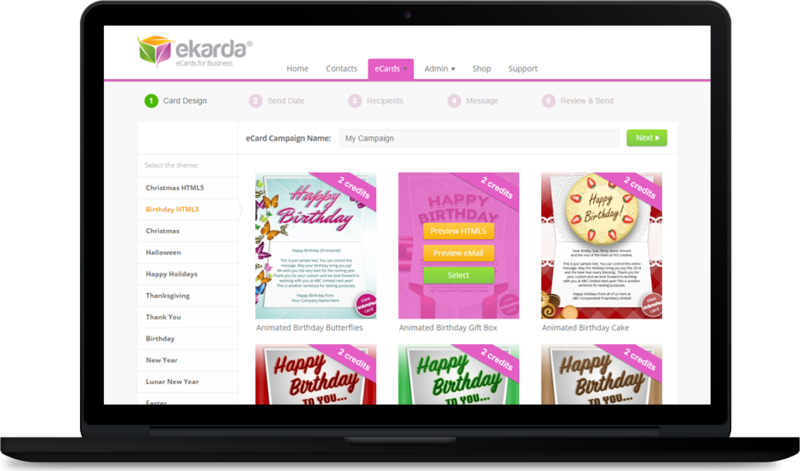 ekarda makes it radically easy to create, send and measure the impact of your corporate eCard campaigns. We found their service to be of extremely high quality and very professional. Everything went perfectly, thank you so much for all your help. The cards were a hit!! Create beautiful eCards featuring your company logo using our eCard templates. Your eCards are guaranteed to look amazing in every inbox, on every device. Upload one or more logos & choose a design from our extensive gallery or have a custom card created. 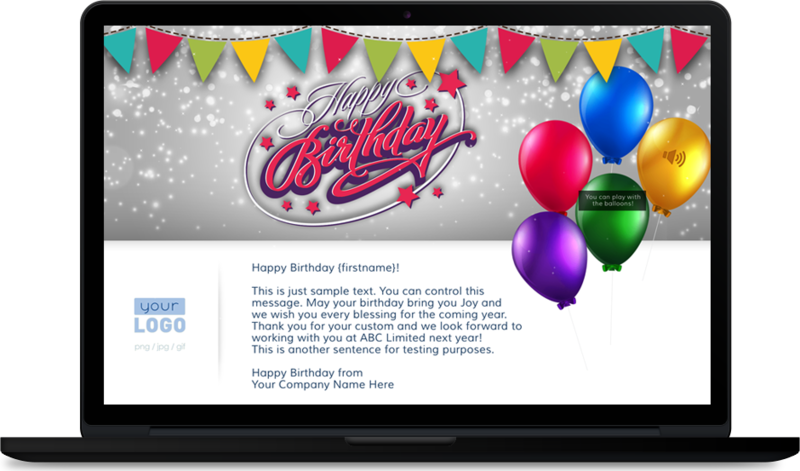 Authorize any number of staff to send eCards using the logos and card designs you control. View your success via in-depth reporting showing bounces and opens for each campaign. With a wide range of high-quality designs and the ability to perfectly match your brand – your eCards will look better than ever. Whether you are an SME or enterprise with 100,000 staff – ekarda has the tools you need. 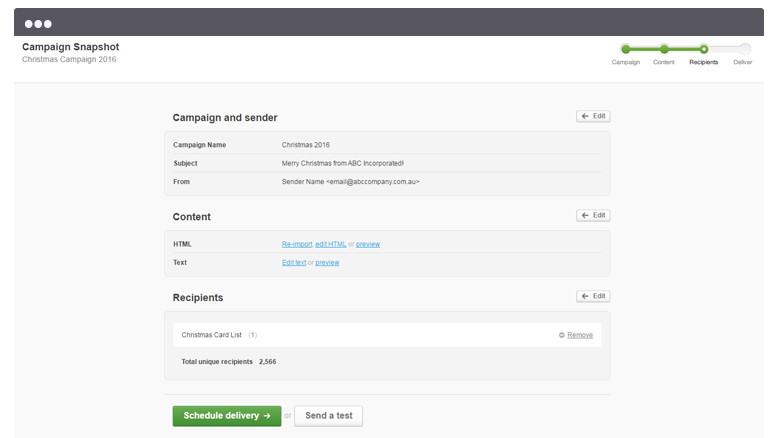 Built-in reporting helps you track the success of your eCard campaigns. You can bring in and organize contact data quickly and easily and even connect to 3rd party apps. Whether you need to send office staff or clients birthday or anniversary eCards ekarda has all tools you need to get it done. 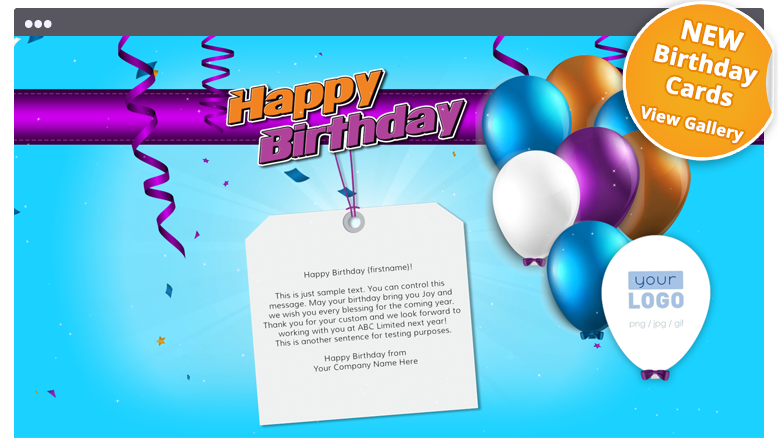 Set-up personalized birthday eCards for all your contacts in just minutes or 5000 Holiday eCards just as easily. If you need to send your Christmas eCards using Outlook or email marketing software like MailChimp or Constant Contact – we can help. We’ll provide you with everything you need to send out beautiful and custom eCards branded with your company logo and message. 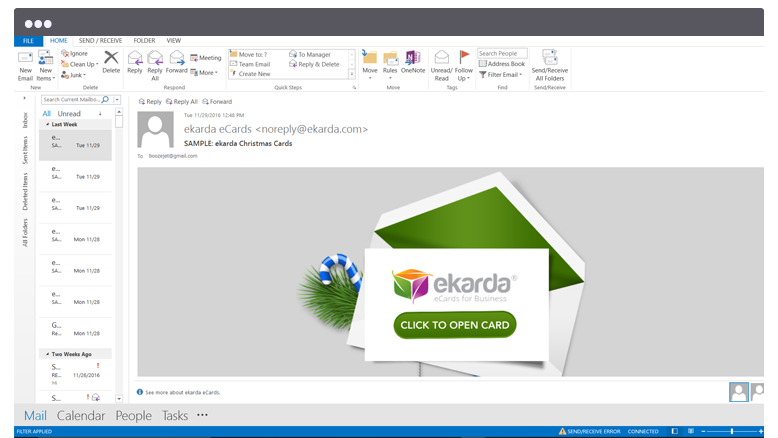 ekarda enables you to send eCards in multiple languages. Whether your eCard recipient’s speak Italian or Danish or virtually any European language – you know that your eCard will arrive in your contacts’ inbox in their native language. Whether you’re a company owner; your employer’s helper; a member of your team’s marketing department; or simply in-charge of sending out Holiday eCards, you are commencing your exploration for ways to get your corporate Christmas holiday eCard ready in-time for the holiday season. Like most, when initially starting to search for information, you open up your internet browser, open your favorite search engine and start researching. In virtually no time, you encounter several business websites providing corporate eCard software offerings — whether paid or free services. After digging a bit deeper into both the free and paid suppliers’ sites, you eventually begin to understand there are a multitude of eCard suppliers out there and all of these vary by creativity, design quality, service levels and much more. Which design and service option is ideal for you? Would you wish to use an existing eCard design or have a custom card created specially? Would you need to be involved in the creative procedure? Would you wish to allow someone manage the process for you? Initially, if you’re brand new to eCards, especially for businesses, you might be feeling somewhat lost. You need to be searching for eCards that create an experience for your recipients as well as extending your wishes. Additionally, creating the expertise to seamlessly include your corporate identity/logo aids recipients connect that experience with your group — crucial for generating awareness and trust in your business. Second, while most organisations do recognize the marketing opportunity that goes along with the holiday season, some do not totally leverage the opportunity. This can be a result of many things, for example lack of budget, or lack of time and internal resources. In fact, time is obviously the greatest factor in the entire process. When wanting to fully take advantage of the marketing potential of corporate eCards for the holiday season, the company really ought to begin planning in December. Now, from our experience, there are businesses that do begin early, but generally, businesses have a tendency to put it off till later in the year and wind up with a ‘just in time’ result. eCards normally come in various shapes and sizes. When deciding on the style of eCard, a few of the things to consider are: the character of your business relationship with your clients, the demographics, cultural diversity and size of your audience. What type of relationship do you have with your Customers? Some service providers may have close business relationships with their customers and therefore are in touch with their customers nearly daily. Business relationships of this kind often result in the service provider and customer to experience a closer relationship than other organisations. On the other hand, other service providers or merchandise sales firms may not have such a close relationship with their customers. They might maintain a very professional, less personal relationship with customers and clients and this should be taken into consideration when choosing an eCard design. In the modern global economy, companies are doing business over every corner of our planet. A normal medium to large company’ customers and clients jointly are varied. It’s common in today’s business world for clients and contacts to: be dispersed across a variety of age groups, cultures, and speak quite a few distinct languages. It’s VIP to consider these sides of your clients prior to choosing your eCard design. 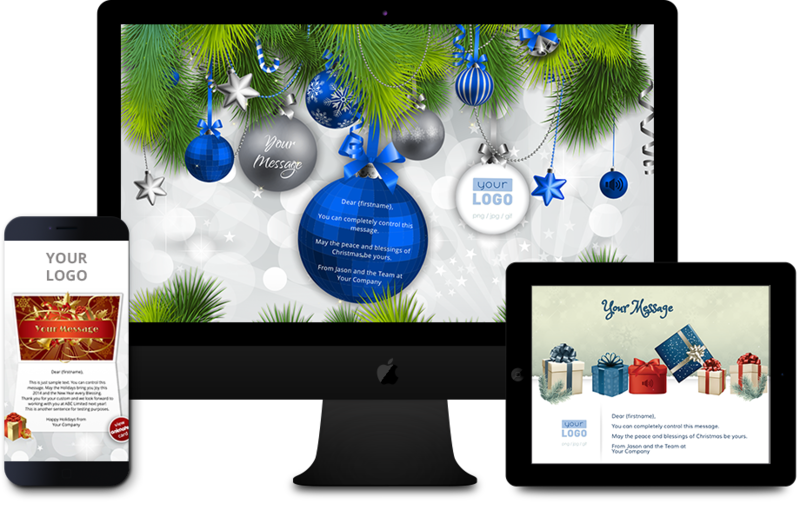 For medium to large organisations with a varied customer and client base, your selected Christmas holiday eCard desig nought to be non-denominational at every aspect. Using particular religious terminology in an eCard could cause some of your recipients to be alienated — or worse, offended. Business Christmas eCards really are a great brand building opportunity once you’re certain that you understand your audience. While we’re on the subject of diversity, if you have international customers with various spoken languages, it’s a great idea to have additional language versions of your eCard created. There’s nothing worse than getting an eCard in a language that you do not know and although English is the most commonly spoken language with several cultures using English as their second language, it’s a far nicer idea to send out an eCard from the recipient’s first language. It shows you care and appreciate the cultural diversity of your customer base. ekarda offers you the option to send campaigns in multiple languages. Please get in touch if you have any queries. Now that we’ve considered your clients and the type of eCard you ought to be sending them, let’s have a look at couple of other crucial areas of the procedure — the technical and creative aspects. When you have an idea of an eCard you want created, keep in mind that completely custom designs can require extra budget. Pricing naturally depends on the amount of complexity and sophistication of the design. 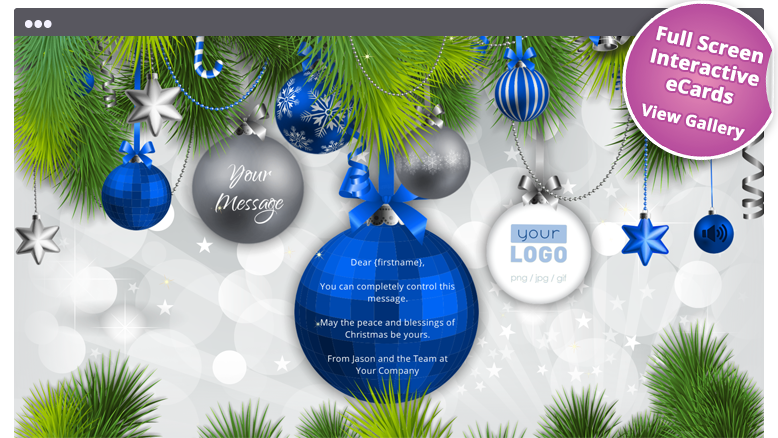 If you do not have a available funds for the design and development of a customised Christmas holiday eCard – one of the terrific things about ekarda is that you can use any (or multiple) card templates from our range at no extra cost. When choosing to proceed with a template design for your business eCard, the provider should have a procedure in place that’s simple, easy to follow, offers extra advice and assistance as needed and allows the design procedure for this project to progress easily and economically. You shouldn’t need to be left guessing what to do at any given point — that’s only the result of a poorly improved procedure and potentially poor organization. Your eCard is an ambassador for your business – so choose your eCard design and vendor carefully! Now that you have selected a card design to dispatch out to your customers and contacts, its time to decide on how you’d like to send out the cards. This really depends on if you have several staff at your business that need to have the ability to send cards themselves, or when you want to manage the deployment of all cards personally. If you decide to manage the entire campaign yourself, then simply sign-up for a free trial account with ekarda. From there its a fantastic idea to assemble all names and email addresses of your contacts into a spreadsheet (MS Excel, Google Sheet etc). Once you have this – login to ekarda and follow the step-by-step instructions to dispatch your campaign. If you decide to allow your employees to dispatch their own eCard campaign out to their company contacts and customers, its best to generate an Excel file with the name and email of every employee. The name and email of every co-worker should be in individual columns. Once you know exactly how many employees who will require access, you can login into your ekarda account and purchase Credits and Senders. Each team member is considered to be a ‘Sender’ so if you have 50 personnel, then you need to purchase 50 Senders and enough Credits for your employees to use. Staff members use the Credits from your account (as your account will be the ‘Administrator’ account). From that point you can then upload your organization logo (your Senders will see the logo when they login to their individual ekarda accounts). You can even choose exactly which card designs your employees can get and deselect any eCard designs that you don’t want employees to have access to. One fast, but very important, note on eCard delivery side of things: when choosing an eCard company for this particular undertaking, make sure you check whether they understand SFP (Sender Framework Policy) and DKIM (DomainKeys Identified Message). Not sure what those are? Make sure the business that you select does or the deliverability of your e-mails might be affected (i.e. emails will be sent, but many may go directly to spam rather than wind up in recipients’ inboxes. By now, you ought to have a good understanding of exactly what the eCard procedure entails by means of design factors as well as the associated processes that are required. So, let’s take a moment to do a fast recap of the key points we’ve covered when deciding upon an eCard design and provider. The eCard company ought to be in a position to produce a corporate eCard that visually gives an experience that the majority of your customers and clients will enjoy, as well as reinforces awareness for your brand without seeming gawdy or unprofessional. For large lists, they supply a solution that can still offer value to a wide and varied audience. The provider has proven expertise with corporate eCards with the knowledge to provide understanding and insight into how you can best achieve your goals. They can also respond to any queries that you have, and have the ability to work with your thoughts given the time period available to you. If time isn’t on your side, they can offer a professional eCard solution that doesn’t take a large contribution from the customer, and still give a great effect past the ‘cute and cuddly’! Also, they can produce a ‘just in time’ solution that’s still great! The eCard company should have the tools and resources to offer a ‘single solution’ for your company’s eCard requrements. They ought to take the guesswork out of the technologies involved and also be able to handle design of the eCard and delivery aspects. They ought to understand the advantages of SFP and DKIM. Also – if you need to empower mutliple staff to send their own cards – the vendor should have the requisite functionality to allow you to achieve your goal. Armed with this advice, we expect you are more educated and confident when seeking an eCard|eCard provider for your corporate, organizational, or staff needs. We’ve worked with several customers from many different countries across the globe, and our encounters with them have helped form our eCard offerings and procedure into, what we believe, is the most professional and capable corporate eCard service available. Click this link to set-up your free trial and get started now!